And more likely than not you’ve experienced it — that sinking feeling when someone says “Let me just fire up my slides,” you see a hodgepodge of bullets and clip art framed in an overbranded corporate template, and you know instantly you’re not going to get the next hour of your life back. It’s worth noting that we have nothing against PowerPoint itself — in fact, PowerPoint can be used to create some incredibly awesome presentations, if you have strong design skills or you know someone who does. But let’s face it — as a culture, we’ve developed some pretty bad, and pervasive, habits in the PowerPoint department, and the truly excellent ones feel like the exception rather than the rule. In our mission to fill the world with beautiful stories and ideas, we feel the time has come for a field guide to diagnose, and fix, the most egregious slide situations that — singlehandedly or in combination — can result in Death by PowerPoint. We invite you to be part of the solution by spotting these common offenses and trying the recommended techniques to transform presentations from something we dread into something we enjoy. Why it’s a problem: Your audience can either listen to you, or read your text, but not both. And if you start reading the text to them, it’s a guaranteed tune-out moment. The solution: Trim your text down to one key point per slide and move any excess information (or your script) to the Notes. The problem: The overbearing corporate template that burdens every single slide with logos, abstract frames in “the brand colors,” copyright strings, and the like. Why it’s a problem: You might be making a cohesive brand statement, but it comes at the expense of your actual content. Trust me on this one–nobody cares about your corporate template except your corporation. Nobody cares about your corporate template except your corporation. The solution: Consider putting your logo and branding on the first and last slides instead of every slide. Another good technique is to evoke brand colors through thoughtful image selection and palettes throughout your slides — you don’t always have to be literal. In Haiku Deck, try searching for “blue abstract,” “blue and green,” etc. The problem: So much data is packed into your chart or table that it’s utterly incomprehensible to everybody except you. Why it’s a problem: When we’re dealing with data, it’s tempting to think that more is more. But when your audience is trying to grasp your point quickly, it can be overwhelming, especially if you are showing a sequence of detailed charts. The solution: Try focusing on one or two key points, even if that means breaking a detailed chart into a series of simpler ones. Look for different ways to tell the story of the number or trend that matters most — which could be a powerful image, a crisp sentence, or a single statistic. Read more about creating simple, stunning Haiku Deck charts and graphs. Why it’s a problem: These bells and whistles take the focus off your content — and, over time, become tedious. The problem: Slide text is too small to read from the back of the room, or on a mobile device. Why it’s a problem: If you’ve ever tried to review a presentation on your iPhone, or had a less-than-ideal seat at a conference, you know the answer to this. The solution: Use big bold fonts and minimize text. Put extra text in the Notes, where it belongs. Why it’s a problem: Images do have the power to truly engage the emotions and add richness of meaning, but you won’t achieve this with cheesy stock photography. The solution: Give yourself time to explore interesting creative directions, and look for images that feel authentic, not staged or posed. Try thinking metaphorically instead of literally — what feeling is at the root of what you’re trying to convey, and what might evoke that feeling? Read more power tips for selecting images effectively here. The problem: Clashing color palettes, mismatched images, and general sloppiness. Why it’s a problem: Even the most compelling and worthy ideas can be diminished when they’re presented in an unappealing way. Even the most compelling and worthy ideas can be diminished when they’re presented in an unappealing way. The solution: Choose a simple color palette for images and graphics, and stick to it throughout. Haiku Deck makes this easy with its one-touch themes. Why it’s a problem: Using these fonts in a professional context can make it hard for people to take your hard work seriously. The solution: There are plenty of fonts that are both friendly and polished. If you’re using Haiku Deck, try Origami or Zissou. Why it’s a problem: There’s a time and a place for concise lists, but bullets can be a cue for your audience to tune out — especially most of your presentation follows the same header-and-bullets format. Unless you’re using them very creatively, bullets = boring. Unless you’re using them very creatively, bullets = boring. The solution: Try breaking bulleted lists into multiple slides so you’re truly focusing on one key point per slide. If a bullet doesn’t feel like it deserves its own slide, cut it or move it to the Notes. Yes, your presentation will have more slides this way, but you can go through them more quickly — and you’ll be more like to hold your audience’s attention along the way. Why it’s a problem: See #8. The solution: Skip the clips, or try a beautiful high-impact image instead. The problem: Excess cutting and pasting = too much going on in one slide — a hodgepodge of fonts, styles, images, and clip art. Why it’s a problem: All that extra stuff detracts from what matters: your message. The solution: Simplify, then simplify again. Strip out anything that doesn’t directly support your message. Strip out anything that doesn’t directly support your message. The problem: Photos obviously pirated from Google Image Search, or worse (visible watermarks are one telltale sign). Why it’s a problem: Using photos without permission, or proper attribution, is poor digital citizenship and may have karmic ramifications. The solution: For free, beautiful images, stick to Creative Commons — learn more about Haiku Deck’s integrated Creative Commons keyword image search (which pulls in image credits automagically) here. Other solutions are to use your own images, or use properly licensed stock photography (for example, Getty Images available via Haiku Deck for iPad). The problem: The presentation drones on and on without a clear takeaway or overarching point. Can be caused by endlessly tweaking and adapting a presentation over and over again. Why it’s a problem: Even if your audience stays with you slide by slide, will they remember anything you said later? The solution: Allow sufficient planning time up front to zero in on the one most important takeaway. A good method is to build out your big idea with three supporting points or examples. Trim out any content that doesn’t clearly support your big idea and save it for another time. The problem: You spent hours making your slides look perfect with a custom font, saved your hard work to a thumb drive or Dropbox, and when you go to present from a different machine? The fonts default to something else altogether, and the alignment is a mess. Why it’s a problem: Funky line breaks, spacing problems, and possibly unreadable text (not to mention wasted time). The solution: Save your work as a PDF instead — or, better yet, use Haiku Deck, which displays your fonts perfectly no matter where you’re viewing or presenting. Why it’s a problem: Taking this approach encourages too much text on slides (see #1, #5, and #9) and detracts attention away from what you’re saying. The solution: Keep your slides minimal and include supplemental information on a separate handout. Haiku Deck this makes this process incredibly easy with PDF handouts. 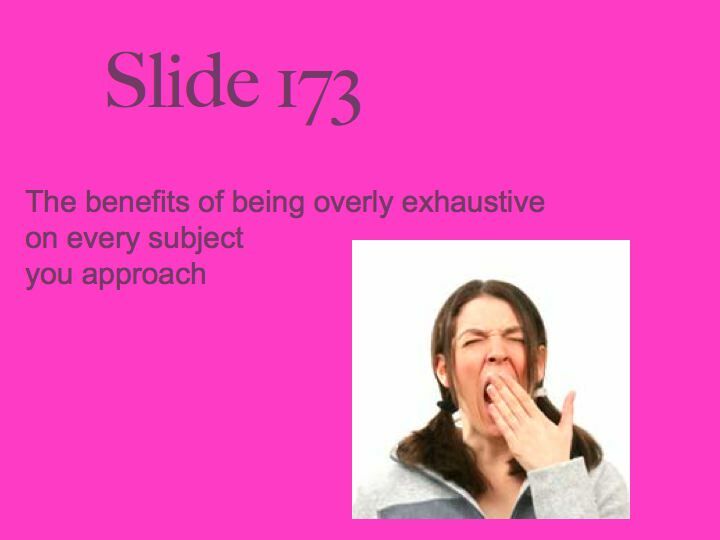 What awful slide types did we forget? Which one bugs you the most? What are your tips for curing Death by PowerPoint? Let us know in the comments!